Whiskyklubben Slainte has done ite again! The whiskyclub has really put the little village of Påarp outside Helsingborg in Sweden on the whiskymap with it's tastings in colossol format. 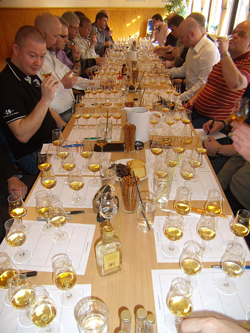 Beside 8-10 ordinary tastings a year the club organize 1-2 BIG tastings a year. March 12 2011 it was time for the ninth big tasting. 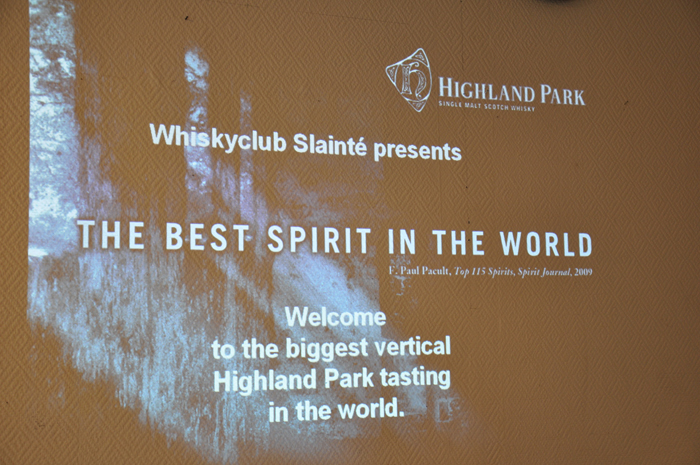 The theme this time was Highland Park. Earlier themes have been Ardbeg (3 times), Rare Malts, Millennium, BenRiach, Springbank and 70's Ardbeg. At these earlier tastings we have tasted 21-25 different whiskies (15 on the 70's Ardbeg tasting), but this time we took it to a whole other level when we served 30 different Highland Park. And all of them were distillery bottlings! Martin Markvardsen was invited to be moderator for the tasting and he and his colleagues at Highland Park had before the tasting checked with big Highland Park collectors aroudn the world and non of them had ever heard of such an extensive tasting as the one that we had in Påarp this day. Gerry Tosh, Global Brand Ambassador at Highland Park, was about to cancel his vacataion with his wife to be able to attend the tasting, but Martin convinced him of the importance of taking care of your marriage, so Gary had to follow the tasting through Facebook. We have spent 1½ years to fins interesting bottles to the tasting and to get a date where Martin could join us and finally we have arrived, says Slainte's founder, Magnus Fagerström. The plan was 24 whiskies but we couldn't help ourselves so we ended up at 30. Because of this we decided to serve 1,5 cl of each instead of the usual 2 cl and that way a few more could also attend the tasting. Everyone still got 45 cl of whisky anyway! There is a lot of logistic that has to be done to be able to do a tasting of this magnitude, but we have done it before so everything is flowing smoothly. 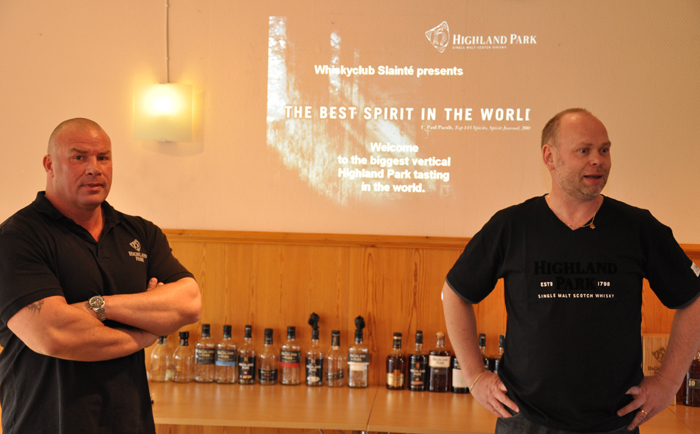 The first flight starts at 2 pm with Martin Markvardsen telling us a bit about Orkney and Highland Park. Then follows 2 hours of intensive tasting. The discussions are many and the venue is filled with laughter and happy faces when the participants are analyzing their whiskies and puting down their scores. After these 2 hours of tasting its time for an one hour foodbreak. Now it's time to put that logistics to a test. Ingredients for sandwiches are being served, coffee is brewed and 400 glasses has to be washed. While its full activity in the kitchen with glasswashing the participants are making their own sandwiches and getting some coffee and water. After the 1-hour break everyone has gotten food and are ready for flight number 2. Martin starts if off with some Highland Park history and then it's time for the flight with the oldest whiskies for the day. Deep sighs of pleasure and amazement are filling the room. The scores in this flight are very high, but that's no wonder when it's 25-37 year old whiskies in the glasses. After the 2-hour tasting it's time for the second 1-hour foodbreak. As by magic a cold buffet is in place with chicken, pork, potatosalland and cheesepie. The greensalad that is served with the food is for some reason not so popular among the guests! More coffee and water is needed after 20 whiskies in 5 hours. Many people think when they hear about these tastings that it's a drunken party, but I can assure you it's NOT. 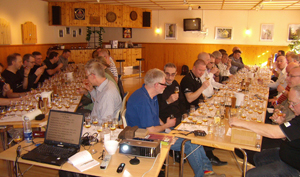 This is a serious whiskytasting and the participants are very fresh and when you look around in the room you see a lot of small samplebottles that are filled with the leftovers for a second tasting another day. Some people prefers to do their own Highland Park vatting by pouring all their leftovers into one 20 cl bottle to take home their own unique Highland Park! Another hour has passed, the glasses are again washed and filled with new whiskies and it's time for today's third and last flight. 10 single casks in full cask strength is now served and after Martin's last talk about Highland Park this day (it was about production technique) it's again time for some serious tasting. This last tasting was really variation on a theme! Oranges, chocolate and raisins were the three most used words to describe the whiskies. It was just a matter of in what order to put them! Around 10 pm the last glass is emptu and 8 hours of whiskytasting is ending. Martin is one big smile and all the participants agreed that they have just experiences another magical day in the whiskyvillage Påarp. Whiskies that were tasted this day.